These expressions of natural beauty are perfect for family, close friends, or special associates at work. These cards open once, with plenty of space to write. A matte finish inside allows for clear penmanship. The picture on the outside is glossy. In addition, the back bears our signiture of authenticity. 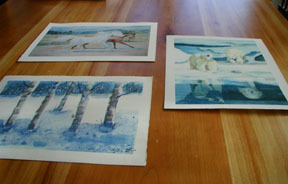 Printed on actual watercolor paper, these copies are virtually indistinguishable from their original. or choose a color yourself! 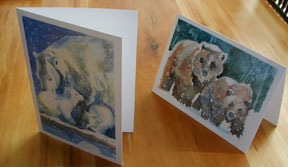 Many original watercolor paintings seen in the galleries of this website are still available! 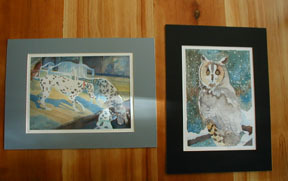 Gail has painted many portraits and animals on a commission basis. Popular subjects may include family members, pets, sports, or landscapes. 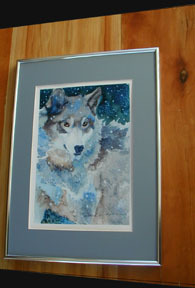 See our "Commissioned Works" page for examples of work that Gail has already sold.